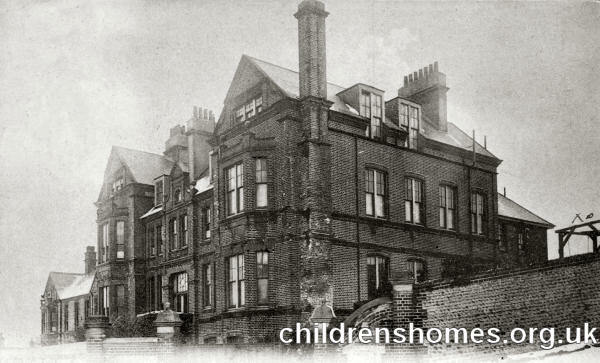 The St John's Home For Convalescent Children was established by Sister Jane Borradaile in 1875. It was originally located at 7 College Place, in the Kemp Town area of Brighton. In the 1890s, it moved to new, purpose-built premises at Walpole Road, Kemp Town. Object.—Primarily to benefit convalescent and delicate children, who, when a lengthened stay at the seaside is deemed essential, can remain permanently in the Home. A few girls over 12 years of age are received, who are trained for domestic service, and in due time are sent into situations. Admission.—By application to the Lady Superintendent; a subscriber's letter or application form, with medical certificate, must be sent in. Age of admission: boys, 2 to 5 years; girls, 2 to 12 years. Annual subscriber of £1. 1s., or donor of £15. 15s., may recommend one patient in each year for 3 weeks free. A bed can be retained in the Home by subscribing £20 a year. To non-subscribers the payment is 9s. a week. The cost of journey from London to Kemp Town, for children under 10 years, is 2s. 2½d. The Home is open all the year round. Management.—By Lady Superior and Lady Workers. Inmates.—About 40 convalescents and 12 training girls. In 1938, the home was taken over by the Waifs and Strays Society as a convalescent home. It could house up to 84 children. In 1941, the home's residents were evacuated to Muntham House at Itchingfield, near Horsham, but returned to Brighton in 1945. In 1956, the home was adapted for use as a school for children with learning disabilities, accommodating up to 55 children from the age of seven upwards. St John's is now an independent specialist school dealing with students having behavioural, emotional and social difficulties.